11 results found within category "Blog". Another spring is upon us and we have 30 little lambs bouncing about the fields. Next week is sheering time. All the mamas will get a new cool summer hair cuts. We are also busy getting ready for the up coming shows. We will be at our local 100 Mile Fleece and Fibre Festival at the Bradley Center in Coombs on May 26, 2019. Schacht Spindle Company is celebrating their 50 anniversary. They have once again put out a Cherry Matchless Spinning Wheel for this celebration. This is a 50 Anniversary Limited Edition item. Now in stock. Check their website for all their anniversary items. We have already welcomed 3 new lambs to the family. Beautiful black triplets! Watch for the photos! It has been a busy year and we have only just started. We have made some updates to the website as we have acquire some new and wonderful items. Grinsheep now carries the Kollage Original Square knitting needles. We have tried them out and have been so nice to knit with. They come double pointed, interchangeable, and regular cable, soft and firm. They are great for those with arthritis! Weaving frames are a hot item these days. If you are interested in weaving please contact the store as we do have a weaving group. Fall is here again !! Wow where does the time fly. We already heading into another fall. We have been so lucky with this beautiful weather. We have had such a busy summer . ANWG at the University of Victoria was so exciting. The workshops were so interested. I learned so much, hope you that got to attend did too. I look forward to trying some new techniques. I will look forward to seeing some new inspirations. We were at the Coombs Fair in August and had some wool demonstrations. The 4H- Wool Craft Club had a tent and also were doing some demonstrations. The kids did so well on all their projects through out the year. They should be very proud of the hard work they put into those projects. Congratulations!! Great Job!! Oct 14, 2017 Spooky Boos and Lil’ Monsters……. Just in time for Halloween. Marion Vandall will again be in town to instruct us in how to make some ghouls. Thanksgiving is here already. We have much to be thankful for . Hope you have a great time with family and friends over this long weekend. A few reminders of the upcoming felting class on Oct 14, 2017. Spooky Boos and Lil Monsters all details can be found on the workshop page. I will be getting ready to attend the King Fisher Annual Retreat October 17, 18, 19, 2017. A fun time with friends to get some projects finished for Christmas or get started on them. Thanks to all who came by to visit us at the Campbell River Fibre Festival. We had a great time and were so busy. A great thanks to the organizers. Especially enjoyed the band ” Inclusion” at the Saturday evening reception. Wow! can’ t wait till next year. We were off to the 100 Mile Fleece and Fibre Fair at the Bradley Center. Another fun filled day with our Fibre folks on home turf. Both festivals have grown into very worth while events. There are so many exciting choices to select from. The last week on this month (June) Diane and I are packing up and heading down to Victoria for the ANWG 2017 Conference being held and the University of Victoria. There will be many workshops and of course a fabulous market place. In October we will at the annual Kingfisher Retreat and then off to the Cowichan Fleece and Fibre Event. Stop by, we love seeing you! Well it is almost here. May will be a busy month. May 9, 2017 Have you ever thought about learning to Weave? On Tuesdays we have the Schacht Cricket club. May 13, 2017 Marion Vandall is returning to teach felting. Come out and join us for Squirrels and nuts. Yes Fall has arrived. Thanks to Marion our teacher we had our first Felting class in September and what fun it was. She taught some very advanced techniques in a short time. She is returning on October 22 for another class. This class is called “Rats, Bats, Cats and Pumpkins” You guessed it Halloween theme. Contact the studio to reserve your spot, as there are a few spaces left. We will be closed on Thanksgiving Sunday and Monday. Enjoy time with your families. We will also be meeting weekly to create hand woven Christmas decorations on Zoom Looms. Watch the events page for more information as it comes available. If you stop by the studio you will see the new SCHACHT FLAT IRON SPINNING WHEEL! So exciting it arrived! You can also see it at the Cowichan Fleece and Fibre Festival Oct 15. The last week in October is the Kingfisher Spinners Retreat. I will be there as coordinator with Dona and also a vendor along side Anna from Qualicum Bay Fibre Works. There are still spaces available. It is a wonderful way to relax with friends between the holidays. In November we will be starting a Cricket Club “no athletics” required. Come learn to weave on these delightful little ridged heddle looms. We don’t want Summer to end:-( Reality Check– September is here! Summer seemed to fly by this year. We have been so busy. Did you see us at Coombs Fall Fair doing demonstrations or see us in Victoria at Fibrations? Boy was it windy there, but we had fun. Our summer special batts were so popular we may have to keep them going well into fall. Have you checked them out at the studio?? We are now getting ready for fall classes. We are having a needle felting class on Saturday September 17 2016. Marion Vandall will be coming up from Victoria to teach. Reserve your spot as class will be limited to 10 people. Please check the events page for more good things to come! We have been now operating as Grinsheep Fibre Production for 3 years 3months. This summer is a busy one for us. We have new fibre and I am processing our own fleeces. We will be excited to show you the natural and our hand dyed colors at the shop or you may want to catch us at Fibrations on Aug 21 in Victoria. 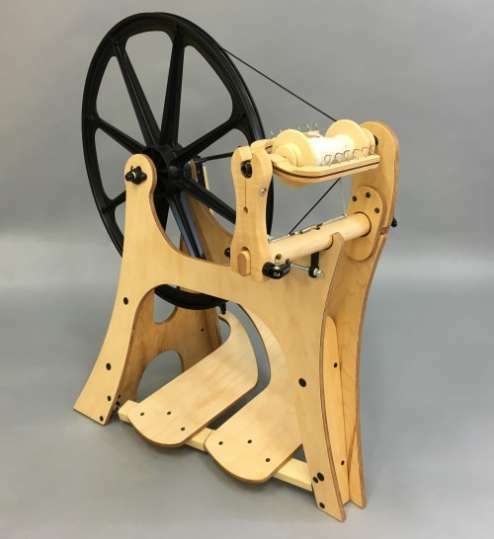 I have pre ordered Schacht’s New Flatiron Spinning Wheel. Can not wait till it arrives and give it a “whorl” so to speak. Please contact me if you want to be one of the first owners.